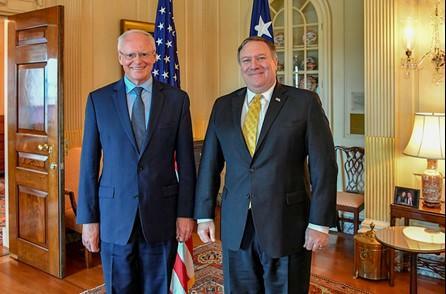 Secretary Pompeo officiates the Swearing-In Ceremony for Ambassador James F. Jeffrey. Actually, the only regime change that is needed is in Washington and it would include Jeffrey, Bolton, Haley, Pompeo, and Miller. And while we’re at it, get rid of son-in-law Jared Kushner and his claque of Orthodox Jews, Jason Greenblatt the “peace negotiator” and David Friedman the U.S. Ambassador in Israel. Jeffrey’s ridiculous prescriptions for the Syrians and Russians are symptomatic of what one gets from a team of yes-men who have latched onto some dystopic ideas and pursued them relentlessly, blinded by what they believe to be American power. Someone should tell them that their antics have made that power a commodity that is dramatically depreciating in value, but it is clear that they are not listening.